The main harbor is popular with sailboats for overnight moorings and with fisherman for pike, smallmouth bass, and perch. This 695-acre island became part of the National Wildlife Refuge system in 1983 when the U.S. Fish and Wildlife Services purchased it from The Nature Conservancy. Harbor Island is overseen by the Seney National Wildlife Refuge in Seney, Michigan. Harbor Island is today as it was when it was formed so many million years ago. It is a pristine virgin wilderness. It has never been timbered or dredged. Harbor Island is shaped like a giant horseshoe lying on top of another, to form two distinct spaces. False harbor, the one to the west as you approach the main harbor, is popular with sailboats for overnight moorings and with fisherman for pike, smallmouth bass and perch. The main harbor a large shallow inner harbor is over ½ mile wide. Harbor Island is zoologically and botanically rich. Harbor Island is part of the North Huron Birding Trail. Cooper hawks, osprey, northern harriers, common loon and bald eagles are all on the state's species of concern list and can be observed here. Of special interest to the botanist are orchids, gentians and lobelias. Walking the deep green forested hills is like walking the halls of a great natural cathedral. Harbor Island hosts a variety of habitats including a marsh that runs almost fully around the main harbor. 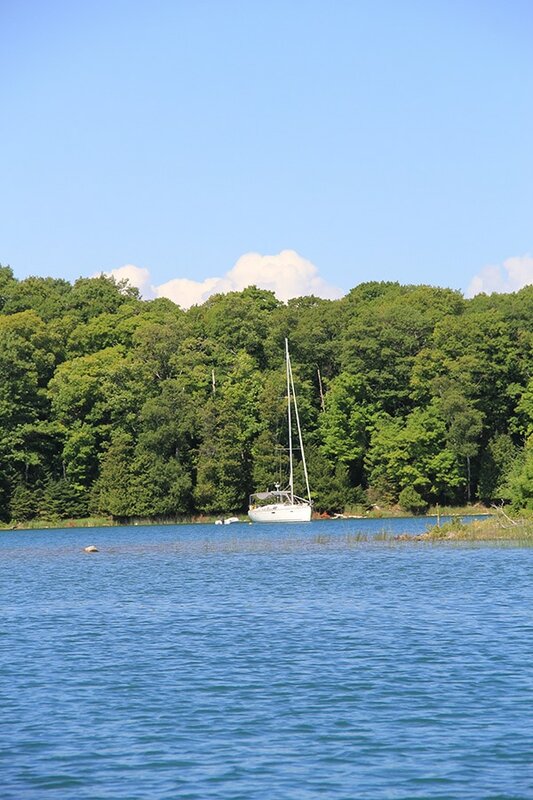 On the north side there are sand beaches, on the east side across from Bald Island is a mature stand of white pine and if you head north from there you will come to what the locals call the narrows. In this area you will find an old growth forest of oak. There are at least thirty-one types of trees and shrubs on Harbor Island. The Island is open for public use during daylight hours only and can be used for hiking and swimming. No fires, no camping and no motorized vehicles are allowed. It’s a “boots only” refuge. The Williams Preserve is mostly forested with either upland mixed hardwood/conifer stands (including white pine and hemlock components); northern hardwood stands dominated by beech and maple (with minor component of ash, ironwood, basswood, and balsam fir); and lowland areas dominated by cedar, balsam fir, and paper birch. Fallow agricultural fields now vegetated with bracken fern, blackberry, and various tree seedlings and saplings are present in small areas. Soils in some areas are flat and sandy, and very rocky in others, with some large boulders. Fissured bedrock is visible at the surface in some spots. Ancient post-glacial lake shorelines are evident on the Preserve. An old stone wall built by early Island settlers is located in the east part of the Preserve. 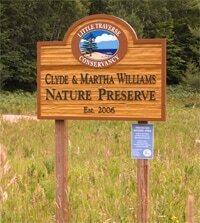 To learn more about the hiking trail that is located on this preserve, visit our "Hiking" page. 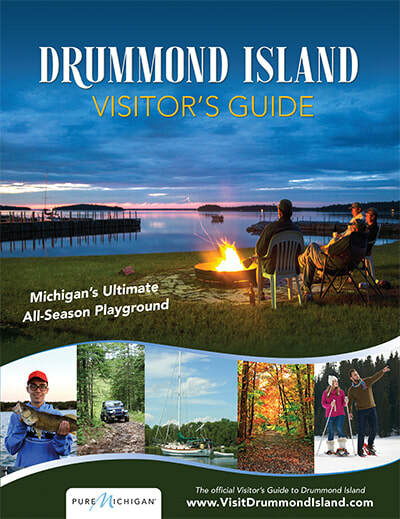 The Drummond Island Township Park is located approximately 6 miles from the Ferry Dock. A directional sign on the left-hand side of M-134 leads you down a very winding hard packed gravel road to the park entrance (0.5 miles). Camping It is a first come, first served park, no reservations. 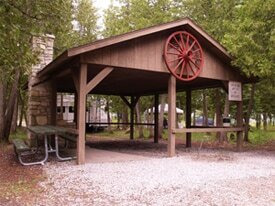 You can elect to use the park on a daily, weekly, or monthly basis. One of the beauties of this park is its vast tree canopy, located on the rocky shore facing west. The sunsets are gorgeous! One section of the park leads you to a sand beach, where the water is nice and shallow about 100 yards out. From the beach you can walk to a neighboring small island, which the kids really enjoy. The park also features the Heritage Trail. This 3.0 mile trail provides a unique experience for birding, hiking or geocaching in the warmer months and snowshoeing in winter.